A man found on a burning yacht at Los Angeles Harbor in San Pedro and removed from the stricken vessel by Los Angeles city firefighters later died at a hospital. Photo via OnScene.TV. 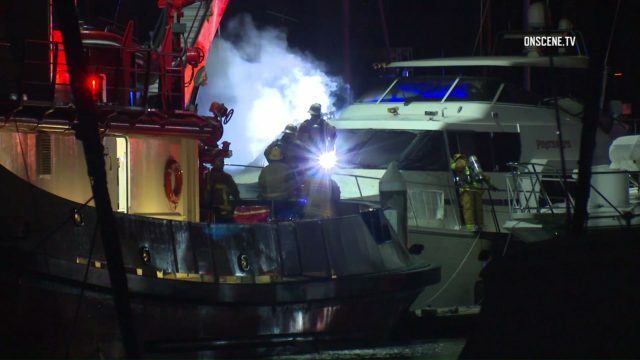 The coroner’s office Saturday released the name of a man found on a burning yacht at Los Angeles Harbor in San Pedro and taken to a hospital where he died. He was Mark Matthews, 65, of Kingsburg, a city in Fresno County. It took 47 firefighters 27 minutes to put out the flames, Bastman said. The cause of death was deferred pending additional investigation, according to the coroner’s website.